Spring is finally here and summer is right around the corner. Tommy H. is preparing to enjoy his pool area to the fullest by using our Aqua Tiles for his pool surround. He’s also installing around a screened in patio and hot tub. Aqua tile is a PVC product made specifically for wet area flooring. Its perforated design allows for easy water drainage so puddles are not an issue. 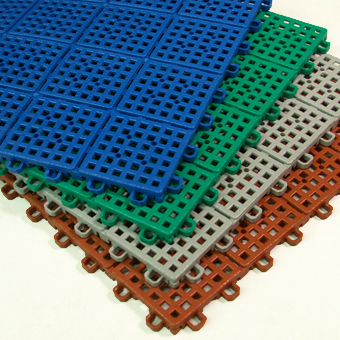 This soft material also feels much more comfortable on bare feet than concrete or some other pool surround materials. Installation of Aqua tiles is a snap. Literally. Just snap the tiles to each other. You need no messy adhesives. When you reach the edge of the pool, these plastic tiles can easily be cut to fit with a utility knife. Tommy used a pruning shears! “Down in south Louisiana (where Tommy lives) the ground always subsides and cracks in the concrete are common.” Aqua tiles are a great solution for this. Available in four colors, green, blue, terracotta, and gray, they match almost any pool décor. Aqua patio tiles are also slip resistant. This is important for areas around pools because kids, whether we like it or not, are apt to run around. It’s far safer to fall on these soft tiles than it is on concrete. Designed for common foot traffic, they can also withstand outdoor tables and chairs. They are manufactured with UV stabilizers in the product mix. This gives them better resistance to sunlight and keeps them from fading as quickly as some other pool surround products on the market. Although designed for outdoor use, they can also be used in a variety of wet areas including basement showers or in spa areas. We asked Tommy if he’d recommend Greatmats to his friends. Thank you, Tommy, for your review. We encourage everyone who has purchased our products to please send in a photo and let us know what you think. We are determined to provide the best products and the best customer service possible.